Now you can enjoy Tony Luke’s award-winning Philly cheesesteaks & chicken cheeseseteaks from anywhere. With Tony Luke’s at home, you get the same experience and quality you would get at any Tony Luke’s location. All ingredients are fresh and authentic. Our bread is genuine Philadelphia bread, hand-spun and baked in Philly. Our sandwiches do NOT use rolls. Plus, we guarantee safe shipping using high quality custom-fitting styrofoam boxes and special ice to ensure our beef & chicken stays frozen and safe. Great for corporate gifts, holiday gifts, college students, football Sundays, events, parties, gifts for food lovers and those that miss the taste of an original South Philly cheesesteak. Order Online – Nationwide Shipping! On February 3rd 1992, Tony Luke and his two sons opened up a small sandwich shop in South Philadelphia. It was not easy—business started slow and the family struggled to keep doors open. But they never gave up on their dream. Tony Luke’s has been featured in GQ Magazine, Gourmet Magazine, The New York Times and is a member of Philly Mag’s Hall of Fame. The shop also appeared on episodes of Throwdown! With Bobby Flay, Man v. Food and Food Wars. Bon Appetit named Tony Luke’s the #1 Cheesesteak in Philly. Want freshly made genuine Tony Luke’s Philadelphia cheesesteaks delivered through the mail to your home? Looking for the best Philly cheesesteak delivery near me? Looking for food gifts to ship or the perfect corporate gift for your employees or customers? We’ve spent over a year in research and development finding the best possible way to recreate the authentic Tony Luke’s experience right in your kitchen. Prep is easy and only fresh ingredients are used. When you buy Tony Luke’s cheesesteaks, we guarantee quality and taste. We only use 100% Rib Eye for our steaks – no fillers! And we take every precaution in buying beef that doesn’t use steroids or antibiotics, visiting the ranch yearly. We only use genuine Philly bread, hand spun and baked in Philadelphia. No rolls are used. Our cheesesteaks are frozen to allow for packaged delivery. We guarantee safe shipping, using high quality custom fitting Styrofoam boxes and special ice to ensure beef and chicken stays frozen and safe. We use cutting edge technology to prepare our sandwiches fresh before freezing so that when you bake them at home, the taste is unmistakably South Philly. 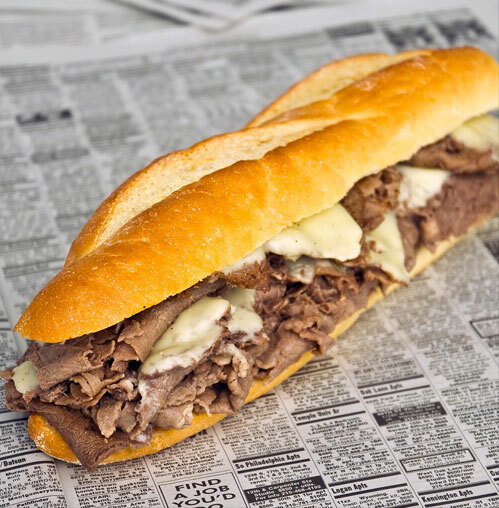 Philly bread + tender, juicy beef + melted cheese equal true Philadelphia bliss. One bite, and you’ll be transported back to South Philly. Order Online Today – Nationawide Shipping!